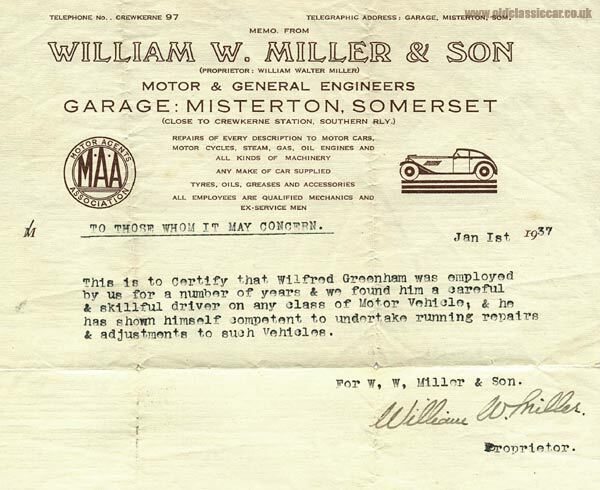 William W Miller & Son, Misterton Garage in Somerset. Homepage. This page: A typed employment reference given by a garage owner in Somerset, January 1937. William W. Miller & Son, 1937. This letter was typed on New Year's Day, 1937, by (or on behalf of) the garage's owner, a Mr William W. Miller, owner of a garage in Misterton, Somerset, in the pre-war years. The letter was a reference for a former employee of the firm, someone who had been ".. a careful and skillful driver on any class of Motor Vehicle ... competent to undertake running repairs & adjustments to such Vehicles." The garage was located close to Crewkerne Station, and offered repairs to motor cars, motor cycles, steam, gas and oil engines, plus all kinds of machinery. Any make of car could be supplied, as could tyres, oils, greases and accessories. Although I've quite a few pieces of paperwork like this, this is the first I've seen that mentions that "all employees are qualified mechanics and ex-service men". As was often the case with businesses like this, they were members of the Motor Agents Association (MAA). There is a Misterton Garage in Crewkerne (a modernday Ford agent), but that was formed in the 1960s so is later than Mr Miller's business featured here.